Now we can all calm down from the excitement surrounding the DFAComatic release with some random pictures and commentary. I spotted yet another Toyota Frus today. This one over at the Northline. How does this happen? I’m on the hunt for the elusive Toyota Odarp that M claims to have spotted in the wild around KAF. If you see it, take a picture. 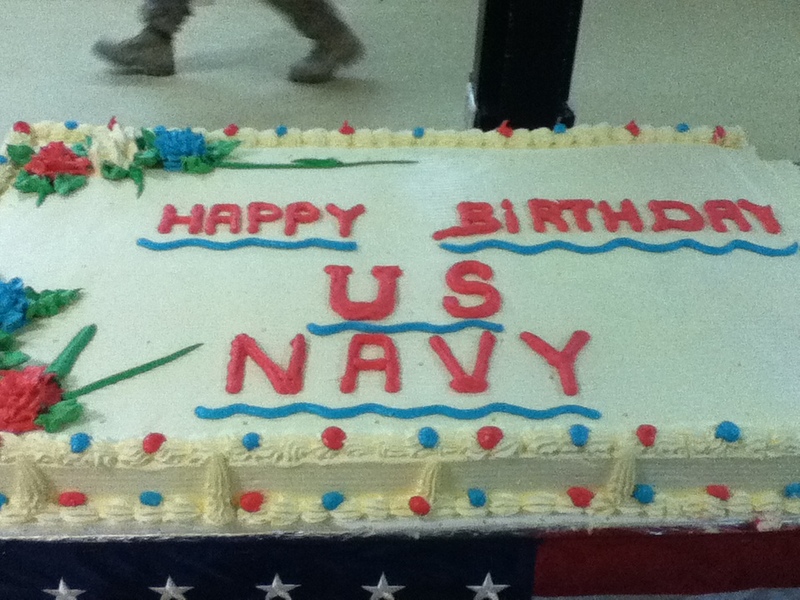 It was the 237 birthday of the US Navy on 13 October. The Lux was having a birthday party for them. Despite the DFAComatic having recommended the Niagara, L insisted that we attend the party. I found this odd as the US Navy was pretty much founded with the sole purpose of defeating L’s homeland. Yay! Cake. Too bad it was “shite”. Anyway, have you ever been to one of those parties where you showed up a little late so you wouldn’t the first to arrive…but you are and it’s just you and the host and maybe one or two others and you’re all uncomfortable and you want to leave but feel you can’t? Yeah, it was kinda like that. My usual strategy at those parties is to drink A LOT really quickly. Then I either become incredibly entertaining and the life of the party or I get asked to leave. A win for me either way. In a boozeless KAF you’re reduced to watching L do the raise the roof motion with the requisite “Woot woot” sound to the bemused stares of the Americans at the next table. At least they had cake. 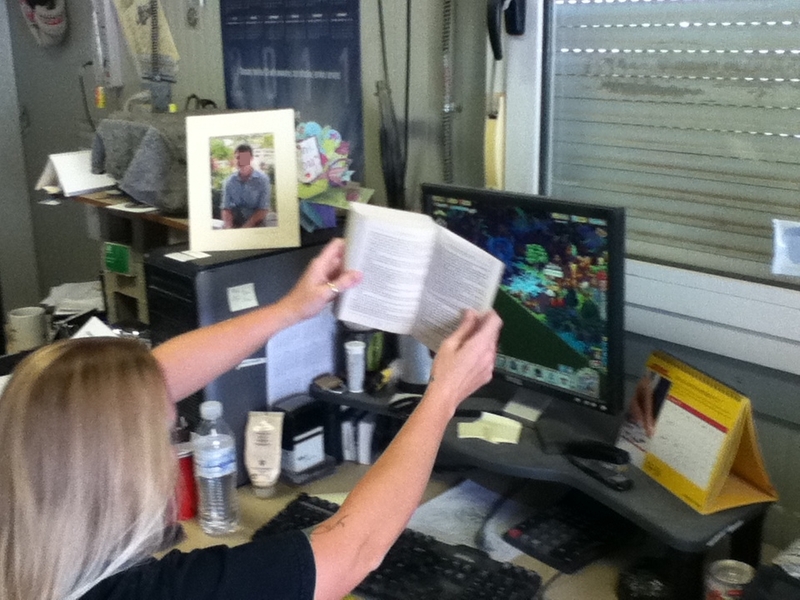 Speaking of L, I walked into her office the other day to ask her if she wanted a game of Call of Duty had completed a very important work assignment. I gotta tell ya, L, attempting to hide the fact that you’re playing Castleville by trying to cover it up the novel you were simultaneously reading doesn’t really fool anyone into thinking you were working. Staying with the “L really needs to go on leave” theme, I feel I must warn the Lemon Drizzle cake manufacturers of the imminent arrival of their “number one fan” in their neck of the woods. L loves, in an unhealthy way, the lemon drizzle cake which is perennially available at the Monti and IH. One of my readers, Ken, tells me that the cake comes from a factory in Amarillo, Texas. How he knows this, I don’t know, but it’s on the internet so it must be true. Anyway, the recently betrothed L is moving to Texas next month to join her American husband. So, Amarillo cake people, if you see this face skulking outside the factory, I suggest you get her some cake and lock the gate. 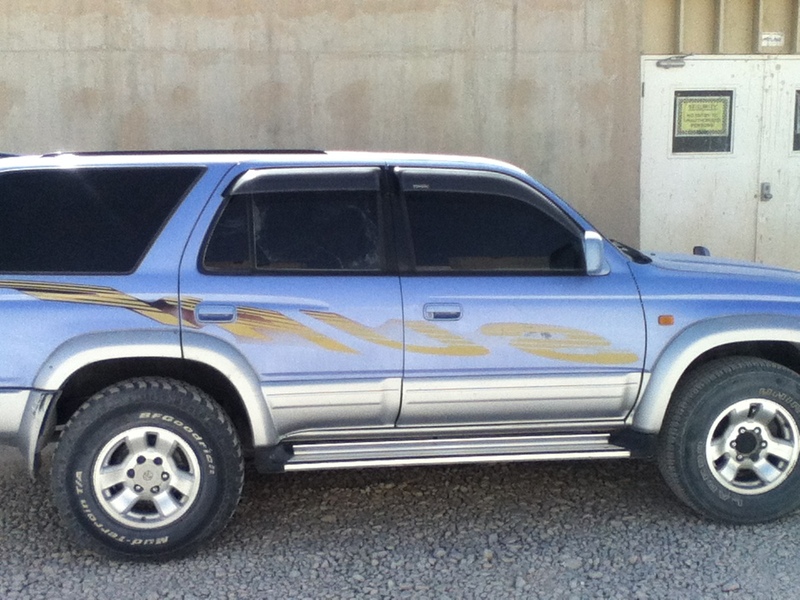 Maybe there’s a job for this sign painter at Toyota, putting decals on Fruses. 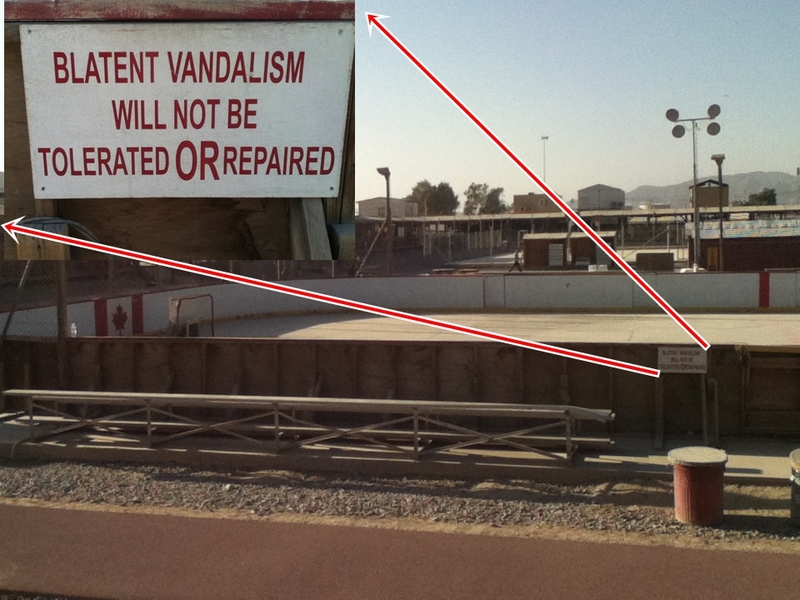 So, let me get this straight, blatent vandalism will not be tolerated or repaired? Boy, not repairing it sure will teach those vandals who wanted the thing destroyed. Subtle vandalism, however, is just fine along with blatant spelling errors? Got it. 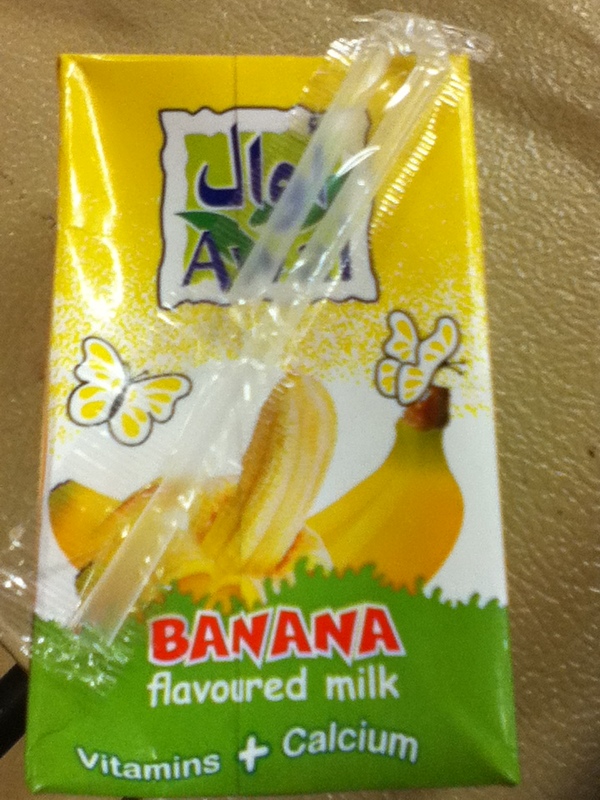 In the “stuff that should never exist” category, I offer you Banana Milk. I have nothing more to say on the matter. Of all the DFAC selection Apps available at the App Store, the DFAComatic is the least likely to cause gingivitis while its effectiveness in preventing rocket attacks is still under study but I bet it’s awesome. Download it today. 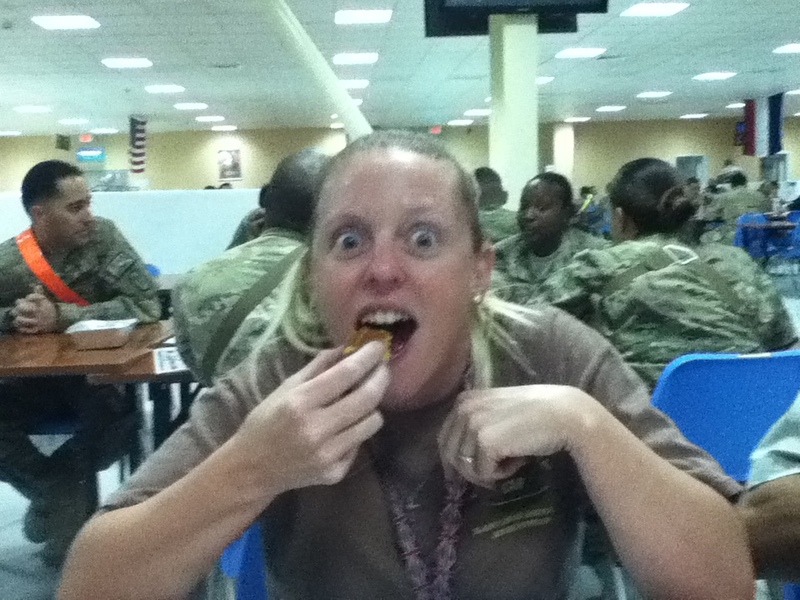 This entry was posted in KAF Life, Luxembourg and tagged Banana Milk, Dfacomatic, KAF, kandahar, Toyota Surf by Kafoodie. Bookmark the permalink. There is some bakery name and “Amarillo, Texas” on the cake boxes the dfac’s delivered to the offsite place we used to eat. Dead giveaway. We now chow at Northline. Yea! Bacon! I’m back home for a nice long sabbatical. Getting used to not having dust as a condiment and doing real work. Be back in January. Save me some cake. I can’t download the app! I need ios6 and I’m a Luddite! Waaa! What’s more important to you? being able to effortlessly select a DFAC or being able to use maps on your IPhone? Priorities man! You worry about the programming, geekboy, and I’ll worry about the branding.